Envision the ultimate kitchen, and we'll help you make it a reality. The kitchen is the heart of the home. At MBS, our goal is to give you the kitchen of your dreams. Sit back and relax while Michigan Building Specialties handles your entire kitchen remodeling project. Let MBS create the custom, luxury kitchen you deserve. Bring your ideas and expectations to us, and together we'll plan your dream kitchen. Our professional design team will seamlessly compose a functional, and beautiful, kitchen remodel, customized for you. Before your project is started, we let you know exactly what to expect. MBS will make your project as hassle-free as possible. Transform the look and feel of your kitchen with high-end cabinetry. Whether your style is bold or classic, modern or minimalist, MBS has the solution for you. The look and feel of a luxury countertop elevates your kitchen from average to impressive. 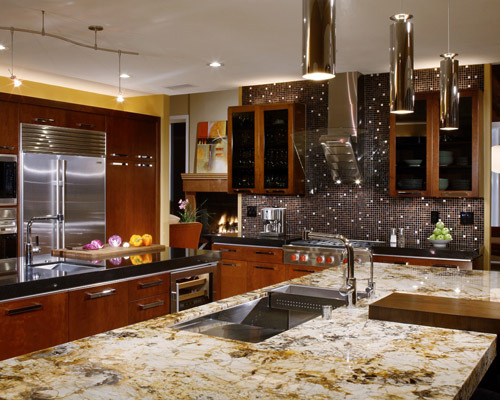 MBS offers a multitude of choices, from solid surface and granite to quartz and more. No kitchen remodeling project is complete without quality flooring. Today's flooring options combine function and style, giving you a variety of exquisite choices. Kitchen lighting needs to do more than look good; it must also function well. At MBS, we'll discuss your lighting plan to create the ambiance, and illumination, you require. Anchor the appearance of your kitchen with appliances that match the decor. Our experts are here to help you discover quality appliances for your remodeled kitchen. Make your dream kitchen a reality with MBS. For a free in-home consultation, contact us online or call us at 866-464-2534.